Monster Hunter: World is all about gear. You character’s strength and skill does not come from levelling up, but from the equipment they wear. 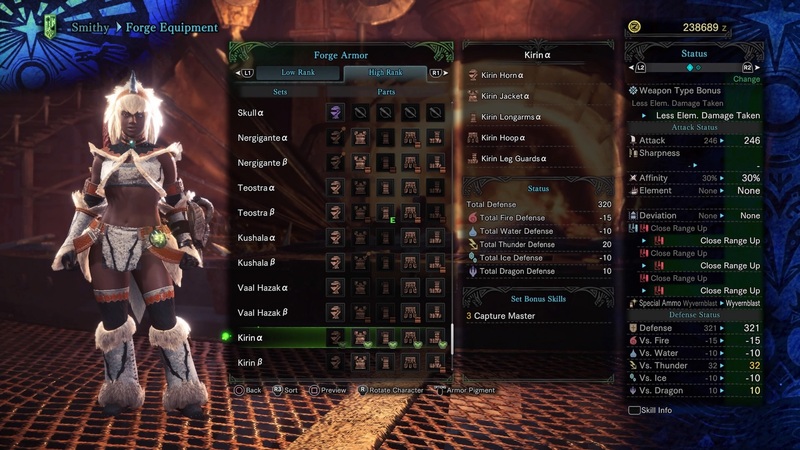 Build flexibility is core to the Monster Hunter experience, so smart hunters will tailor their loadout to the specific target they’re tracking – there’s no single correct armour build here. Mixing and matching armour from different sets can help give you the different moves and resistances needed to take down certain foe, but there are a lot of sets that provide bonus abilities if you wear enough pieces, too. 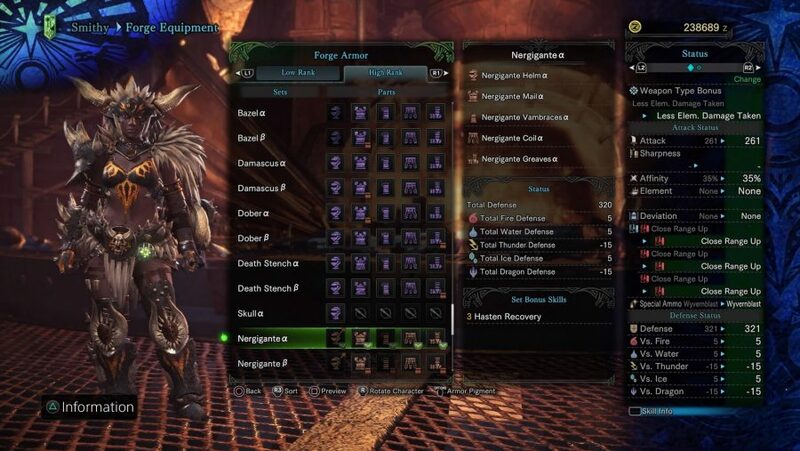 Fashion hunting is another reason to don a full matching set – it just feels good to put on every bit of Uragaan armor in order to look like a Mega Man robot master. With all that in mind, we’ve picked seven great full sets of armour, chosen for their base skills, looks, and bonus skills. Vaal Hazak isn’t the toughest of the Elder Dragons, but the armour you can build from its parts is exceptional. Not only does it make your hunter look like a force to be reckoned with, it also comes with a very useful set bonus. By wearing three pieces of this armour, you’ll gain the benefit of Super Recovery, meaning you don’t have to worry about your health as much, which will let you focus on the hunt. 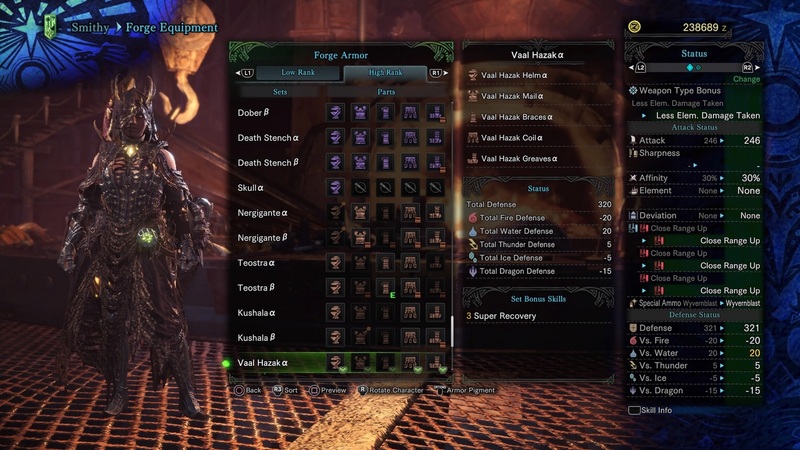 It’s also one of the few armour sets that increases the damage of dragon element weapons, which means Vaal Hazak should probably be your first Elder Dragon target after Nergigante. Rathalos is easily one of the hardest hunts in the game. 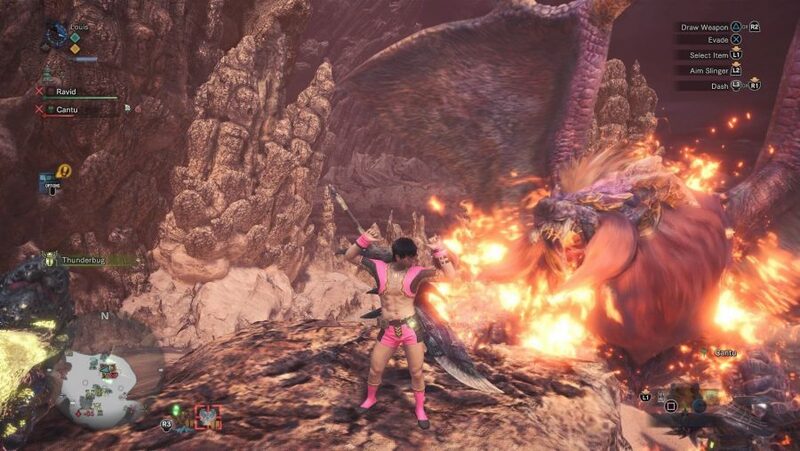 It serves as a major skill check before taking on High Rank quests, and its combination of fire and poison attacks require some serious pre-hunt preparation. Getting that sweet, sweet armour set makes the trial worth the effort, though. This set pairs great with fire element weapons, and the set bonuses only sweeten the deal. At two pieces of Rathalos armour, your critical hits will be powered up if you’re using an elemental weapon. At four pieces, your attacks will no longer bounce off monsters. Both bonuses are very useful, making that Rathalos hunt more than worthwhile. Nergigante spends much of Monster Hunter: World’s story taunting you by dropping in on the Zorah Magdaros missions. That’s why it feels so good to finally slay the beast near the end of the game. That the armour you can craft from its corpse looks awesome and has an incredibly useful set bonus skill in Hasten Recovery is just icing on the cake. The base skills are very useful, too: Agitator, one of the best skills in the game, boosts your attack whenever a monster becomes enraged, which is almost always. Wear that mantle proud, hunter. If quick weapons are your speciality, the Odogaron armour set is calling your name. 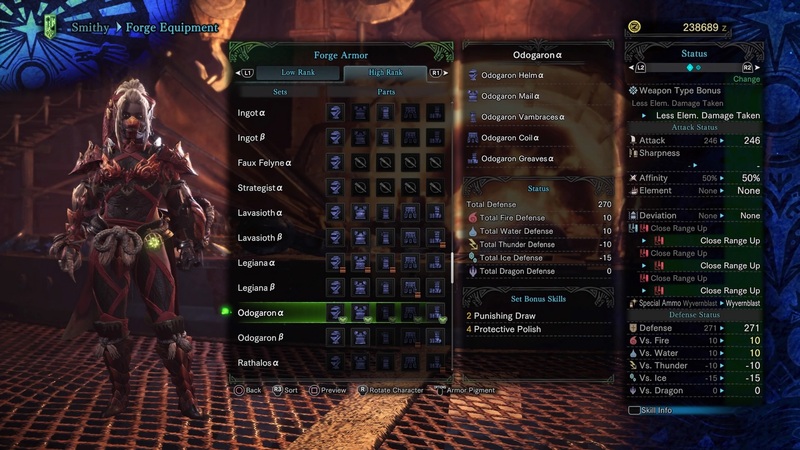 Odogaron Mastery provides skills that greatly benefit fast weapons like the sword and shield or dual blades. 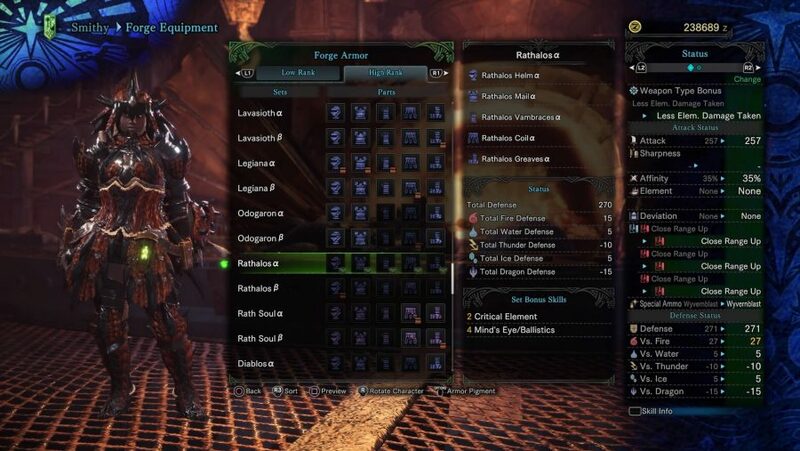 At two pieces of Odogaron armour, you’ll get Punishing Draw, which buffs the damage you’ll do with attacks that unsheathe your weapon. Faster weapons blow through sharpness very quickly, so Protective Polish, the four-piece skill, is very important, even in many mixed-set builds. You won’t encounter the Kirin until late in the game, and farming this lithe and nimble beast can be difficult, but the rewards are worth it. Gather enough materials to make three pieces of Kirin armour and you’ll gain the Capture Master skill which increases the number of rewards you earn from capturing monsters. Considering capturing is already more lucrative than killing the monsters, Capture Master is an ideal choice for endgame farming. Diablos is a Monster Hunter classic, a first-generation beast that demands respect and a careful approach. 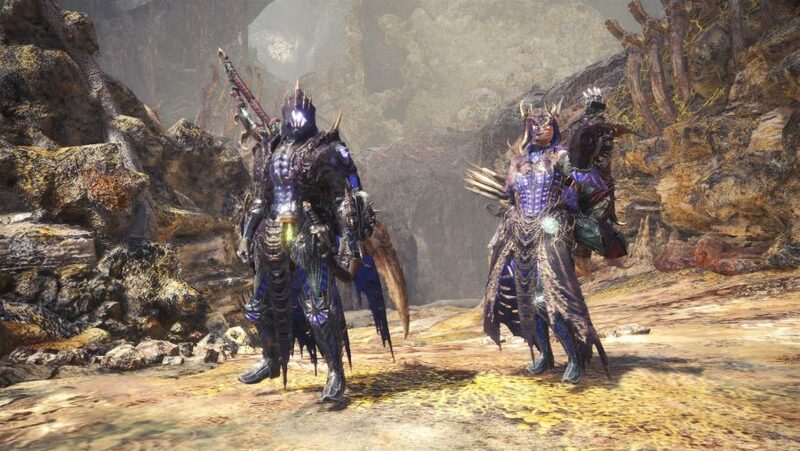 This armour set is the perfect trophy to show off your monster hunting chops. The bonus skills are good, but not great unless you favour non-elemental weapons, and bludgeoner isn’t a bad skill for weapons that lose their sharpness quickly, but it’s not game changing. 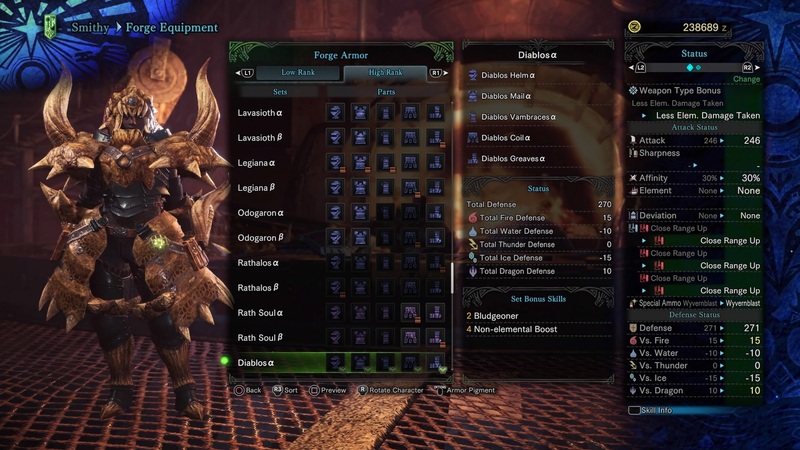 The base skills are good for weapons that are good at stunning like the hammer and the hunting horn. The set is spectacular when worn, too, which is easily the most important part of any armour. Sometimes you just want to run free – free as the wind blows, and to hell with the enormously dangerous monsters roaming about. No Anjanath can stop you, nor proximity to deadly lava. Underwear runs are about being untethered by man-made restraints, about proving that you don’t need armour to take down an Elder Dragon. What monster is waiting just around the corner? Who cares when you’re this free?